Naim HDX review | What Hi-Fi? Yes, we know that for a lot less than the £4500 price-tag on the new Naim HDX digital music player you could put together a computer-based solution able to do most of what this machine can manage. 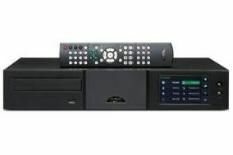 What the HDX does, however, is put together everything you need to store music at CD quality and beyond, and make it elegant, easy to use and great-sounding. It's no harder to use than a CD player, makes perfect copies of discs onto its 400GB hard-drive – which is backed up by another drive of the same size to keep your music safe – and provides a logical, clear and totally flexible interface to the user. And, of course, it has had close attention paid to audio quality. That means separate power supply transformers for the audio section and all the storage and control gubbins, and a high-quality audio output section optically isolated from the digital electronics in the quest for quality. Outputs are available on phono sockets, the usual Naim DINs, and optical and electrical digital connections. Oh, and it can also be upgraded. A rear-panel multi-pin socket can be used to hook up either the XPS2 or PS555 power supplies, as used with the company's flagship CD players, for even better sound-quality. Four USB sockets allow the connection of external drives or other control devices, and the HDX can be used as a standalone player with a conventional amp and speakers system, or will stream to Netstream devices. As standard it will hold about 650 discs at full CD quality, and as well as MP3 WMA and AAC files, it can also store and play .wav and FLAC files of up to 24-bit/96kHz quality. The big question, of course, is how the HDX sounds, and it's here that this player really scores. Discs copied to it don't just sound as good as the original; in some cases – well, in most cases, actually – they sound better. The player takes longer than some to rip music, keeping going until exactly the same data has been read from the disc at least twice to ensure that it's making a perfect copy. The fact that this gives the playback systems less work to do clearly plays a part in just how good this machine sounds, with a tight, clean and yet fully extended bass, a clear, beautifully detailed midband and excellent air and sparkle in the treble. There's nothing harsh or mechanical here, just the usual Naim combination of drive, finesse and atmosphere, combined with serious power and punch. That's as true with delicate solo piano as it is with hard-driving rock or pop or jangly acoustic music, and the HDX also has all the scale and weight you could want. Add to that the constant temptation of having all that music on tap, and the first encounter with the HDX is very likely to have you first hooked, then addicted.